“Old Mother West Wind came down from the Purple Hills in the golden light of the early morning. Over her shoulders was slung a bag – a great big bag – and in the bag were all of Old Mother West Wind’s children, the Merry Little Breezes.”……” When she reached the Green Meadows, Old Mother West Wind opened her bag, turned it upside down and shook it. Out tumbled all the Merry Little Breezes and began to spin round and round….” The Merry Little Breezes explore the forest one story at a time. 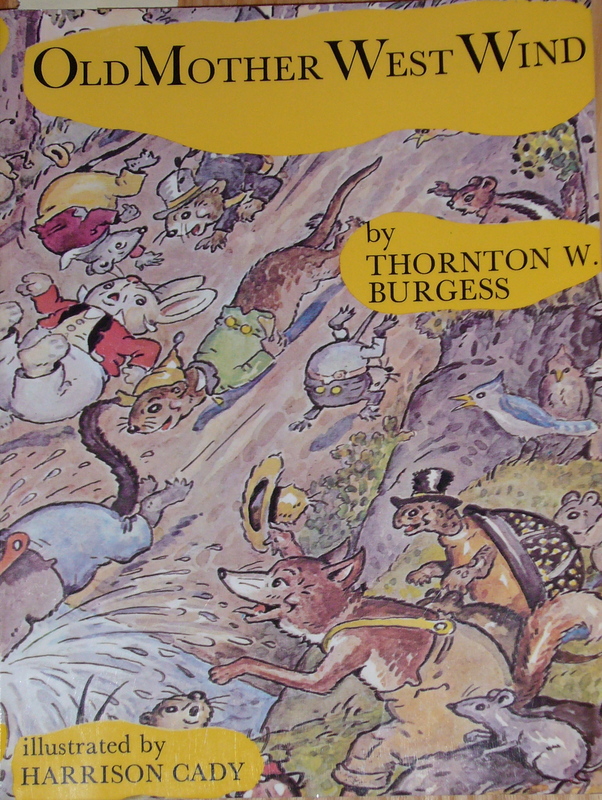 Mr. Burgess collected 16 tales in this volume, the first of over seventy books.Through nature we learn how to behave and why rules are important. Qualities of loyalty, friendship, trust, hard work and the consequences of misbehavior are all lessons we hope to instill in our children, as well as hold in our subconscious forever. My favorite story is “The Tale of Tommy Trout, who Didn’t Mind”. Tommy Trout is warned not to venture out of the Laughing Brook, but his curiosity leads him beyond safety and into the mouth of a great big, big fish. “Ah-ha”…”I like little trouts.”……”And nothing more was ever heard of Tommy Trout, who didn’t mind.” The End. Although grim, it is powerful in its blunt simplicity. I recommend this be Read To Children ages 3-7 years by an adult, in order to able to discuss the stories meanings.